Leave the dried locust beans in hot water for circa five minutes and peel off the dried skin of each locust bean before you start cooking your ewedu soup. If your locust beans are fresh, then there is no need for this process. If you have fresh ewedu leaves, you will need to pluck each leaf without the stems but if you decide to use frozen ewedu leaves like I did, they usually come already plucked and you will simply pour it into a blender, add some water and blend to gain smoothness. Put a reasonably sized pot on fire and add some water depending on the quantity of Ewedu leaves. Please refer to my How to cook Ewedu Soup, YouTube video for guidelines. Once the water reaches boiling point, drop in the potash (kaun) and it will dissolve almost immediately due to the boiling water. Add the blended Ewedu leaves to the boiling water, add your preferred seasoning, add salt and stir. Leave it on fire for about ten minutes and add the locust beans. Stir and leave on fire for 3 to 5 minutes and your ewedu soup is ready to be served. Asun (Spicy Goat Meat) is one of the numerous tongues wagging Nigerian food. 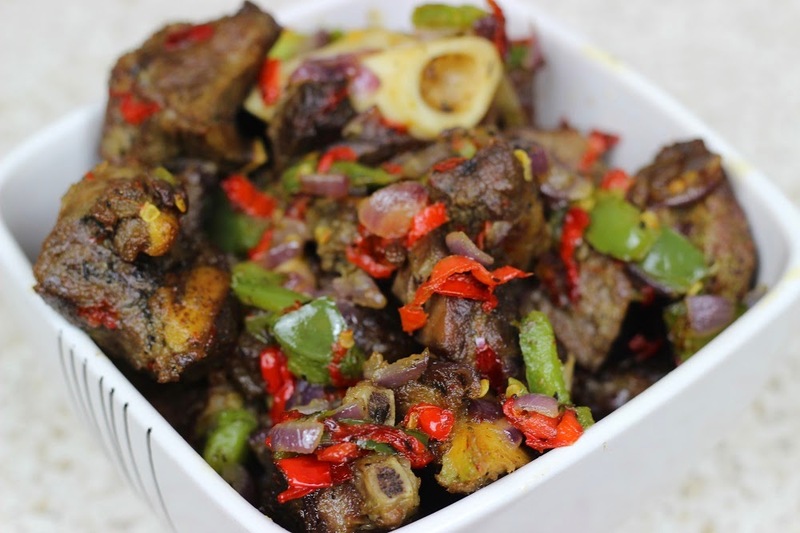 In order to achieve a tasty Asun (spicy goat meat), you must use goat meat only. Traditionally in Nigeria, the meat is smoked / grilled with the application of locally made grilled. It’s usually wire gauze sitting on top of a base filled with red hot charcoal. As I live abroad like my many others, weather and location can be a form of hindrance when trying to achieve the traditional set up for making Asun or learning how to make asun. Having said that, you can still get to prepare a mouth watering Asun (Spicy Goat Meat) by following my steps on how to make asun.